Williamsport, PA - Lycoming College celebrated the dedication of a bust for legendary head football coach Frank Girardi at the homecoming game against Widener on October 20, 2012. The complete project was named “The Turf Project” which included a new turf field and a memorial to Girardi. Close to one million dollars was raised for this special day in Lycoming football history. Many worked very hard on the project, but maybe none more committed than Steve Wiser. In talking to head football coach Mike Clark, this project would not have happened without the passion, energy and perseverance of Steve. 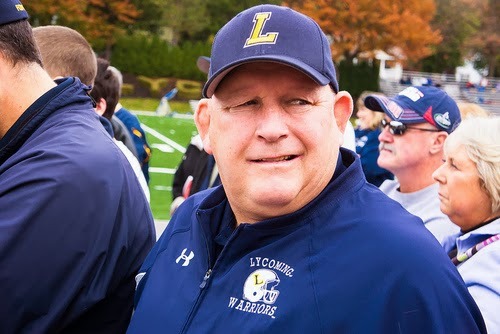 Wiser is the Assistant Head Coach and Defensive Coordinator of the successful Lycoming College Warrior’s football program. Mike gives Steve a lot of the credit for the success of this project, but praised many others for helping with this successful project, including Girardi. But the energy of Steve Wiser made this project successful. Mike believes it is unheard of to gather a large number of donors for a fundraising project, instead of having one person give 25-50% of the total cost of the project. “And everyone in the room thought it was possible to raise the money, but Steve Wiser was certain it would happen,” Mike said. “I might have been 51% yes and 49% no, so I wasn’t a pessimist,” Clark joked. “He is the most competitive person that I have ever met,” Mike stated. “The Wizard,” as coach Girardi once nicknamed him, was a wrestler and football player for the Warriors in the early ’70s. He was known for his passion for both sports and had the ability to lift up players around him making them better than they thought possible. He seems to have this influential way about him that lifts people up and turns things around. That is mainly why he decided to come to Lycoming instead of going to Penn State. So he decided to play for a football team that was one of the worst in Division III football. After four years of football, Steve Wiser accepted an offer from Frank Girardi to coach the linebackers in 1975. In his first year of coaching, the Warrior defense was ranked number one in the country in Division III, which is some turnaround. Girardi must have seen the possibilities in Steve, his passion for the game and his influence on others around him. He promoted “Wise” to defensive coordinator in 1977. Under Steve’s guidance, the Warriors had the countries No. 1 defense in 1983. Other records continued to flow in for the Warriors. In 16 different seasons, Wiser has coordinated the No. 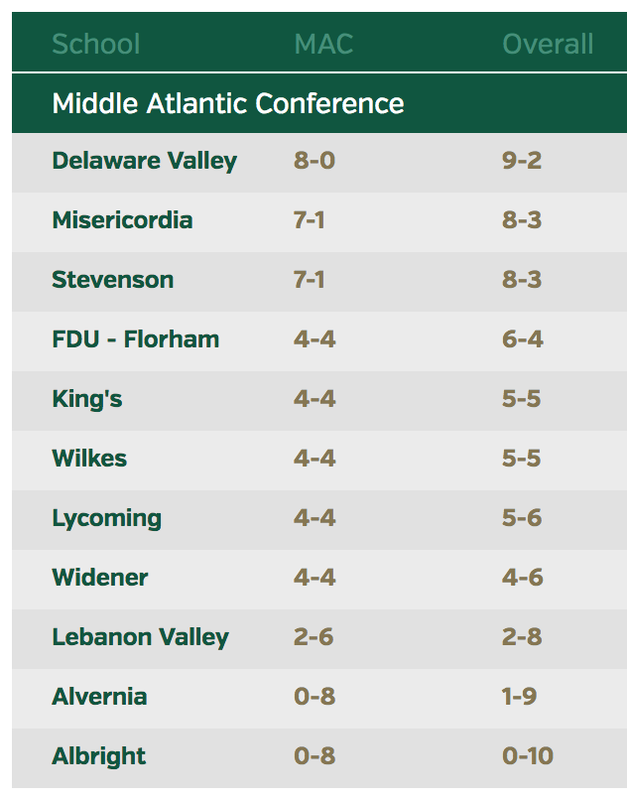 1 overall defense in the MAC. And along the way, he has helped guide the team to 12 NCAA playoff berths and a pair of Stagg Bowls (’90 and ’97), one of just 14 programs in the country to reach multiple Stagg Bowls. Steve told Andrew Lovell of D3Football recently, “I’ve been very blessed. God has been very, very good to me and put me in the right places at the right times and with the right people.” This is typical Steve, deflecting praise. This is one of the most impressive things about Steve Wiser, in my opinion. The humility of the guy and the way he always praises others when he has success. He is one of those people that when you tell him “Nice job,” or “The team played great,” he will point that praise to the head coach or his staff for the preparation for the game. He then throws the conversation to the players for their hard work. He never takes credit for any success. In his Lycoming coaching career, Steve has been such a great influence on so many young men. If you figure Lycoming recruits 30 players each year, his life has touched at least 1200 young men and instilled in them passion, loyalty, perseverance and family. I saw first-hand what it means to be a player for Wiser last year when I interviewed him on a writing project I am doing. He received a call from one of his players who graduated some time ago. He asked how this young man was doing, what he was doing, how the family was and reminiscing on old times. It was obvious to me that this person was still part of the Warrior family. Steve always follows up on everything. You may consider him a workaholic, because he is always busy. An acquaintance of mine talked about buying a home in the area and Steve said he would contact a friend who is a real estate agent to call him. The agent called and apologized that he had to contact him or Steve would be on his case if he didn’t. He always follows up and makes sure you do what you say you are going to do. He always keeps in contact. Mike Clark said that Steve has everything in order, whether it is studying defensive schemes, coaching the kickoff team, recruiting, or being our best fundraiser. He goes on vacation at the beach, and he is calling people for the golf outing. His work ethic is second to none. So at the Frank Girardi Bust dedication October 20, 2012, I stood there, as the dignitaries eulogized Girardi and looked over to where Steve Wiser stood. He was watching the legacy of Coach “G” in the background of the large crowd and I thought how much Lycoming College and Frank mean to him. He was so willing to just stand back and enjoy something that he has had such a big part in. Not wanting the limelight, he is content to just being a part of changing something that had not been at the top of the Division III football. I thought, this man, Steve Wiser truly has his own legacy at Lycoming College.